As more households today claim ownership to an extensive number of electronic devices, ranging from sound systems to televisions to computers, laptops and entertainment systems, a relocation means that consideration must be made to safely and correctly move such items when the need arises. 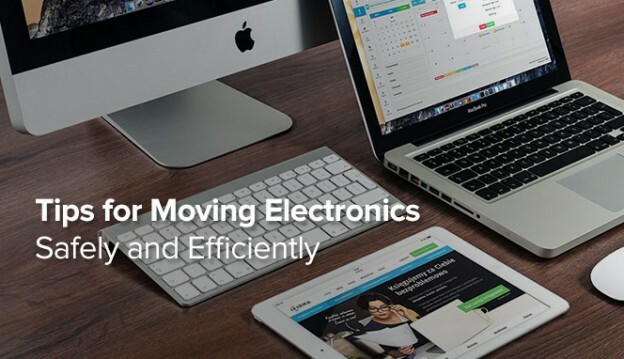 My own experience with various electronic devices during multiple moves over the last two decades has taught me the most effective way to prepare, pack and transport my valuable electronic equipment to new locations. The benefit of a friendly and courteous move coordinator has helped in the details of getting my move completed. Here are some of the ideas which I’ve gleaned from experience. One of the single most helpful suggestions to prepare my electronic devices for a move, even a move from one room to another, was to take a picture of all the wires and connections in place. This should be done before any of the wires are removed. I took time to further label each connection with a name tag. I used peel-and-stick labels. After taking several pictures with good lighting, I attached the labels to each cord or connection before pulling the plug. I remove the plugs one at a time, and isolate the entire cord, taking note of the connection not only on the electronic end, but on the other end, whether it is a surge protector or electrical outlet. Each cord is rolled independently and bundled with rubber bands or twist ties. Where appropriate the cords are placed in a clear plastic bag and taped to the case of the electronic device. Several tips are related to actions which should be taken before beginning the disconnection process. Always make sure that a full backup is completed before disconnecting any of the devices. The backup should be retained on an external hard drive, thumb drive or similar equipment. Using the Cloud will help with certain types of files. I personally like the idea of more than one backup option. Before packing the device, it should be allowed to come to room temperature. For many devices, extremes of temperature can damage sensitive components. Another action to take before packing is to remove any toner or ink cartridges from the device and bag them with appropriate labels. Leaking toner or ink can create a mess which is very difficult to clean up. I also make sure that there are no DVDs or CDs remaining in the computer or other electronics. Referring to manufacturers’ instructions is an excellent idea. I found, for example that some of the computers suggest placing a blank floppy disc in the drive if your device has an A drive. The suggestions for packing electronics can often be found online, if you have misplaced the original books or manuals. I maintain an inventory of serial numbers in my important papers. This list should be updated whenever a new device is added or an old one is discarded. A list of the electronics which were turned over to the movers is easy to check when the unloading is begun at the destination. Such a list is also a good insurance policy documentation resource. Although it isn’t always possible, it helps to use the original boxes of the electronics when it’s time to move. These boxes are typically sized to exactly hold the device, cords and instruction manuals. They often have foam positioners to hold the equipment securely in place. There may be plastic bags to protect from dust and debris. This is the preferred method, but may not be possible because the original boxes were not kept. If the original boxes are not available, it is best to use heavy corrugated cardboard boxes with just enough space to add packing materials. A layer of bubble wrap should be the initial layer. The equipment can then be surrounded by packing peanuts, but not those which are made of plastic or Styrofoam. These may create damaging static which can damage sensitive equipment. Cheap or flimsy boxes are not recommended, even if the contents are not heavyweight items. This is one place where I do not try to economize. When I’m packing for my move, I don’t want to lose track of specific instructions, whether they are in print form or CD form. I have tried several methods to manage these items, and the one that works the best for me is to place the manuals with the device. On other occasions, I placed all of these resource materials in small boxes, but found I needed the information at times when setting up the device in the new location. If you choose the separate box option, it is best to use small ones so that the weight doesn’t become an issue. An exception to the idea of cardboard boxes for everything is found in packing plasma screens and LCD screens. These electronics are extremely fragile items and should be crated. In my own case, I spoke with the moving company coordinator and arranged for the movers to crate and pack these large, fragile and expensive items. The weight of the device was another factor which I did not want to deal with. Further, the recommendation of the manufacturer is to allow the device to “set” for several hours once it reached the designation, before turning on the set. Another place where I never try to scrimp is in sealing the moving boxes for electronics or other items. Every opening in the box is sealed with packing tape. I learned the hard way during one of my moves when I had to store items temporarily. During the two to three weeks when the boxes were in a friend’s basement, rodents managed to gain access into a box that had only been sealed at the top. In addition to sealing all of the openings, I always place tape completely around the box as extra insurance. It may seem like overkill to some, but if I am releasing my electronics boxes to movers, friends or family members, every box is marked “Fragile” on each surface of the box. The best tip I have found for moving valuable electronics is to work closely with the moving coordinator. He or she has the expertise to make the best decisions about moving specific items. Great tips on moving. I agree with keeping the manuals with the equipment.